Children brand new to English, as well as children who are studying English, will love English Adventure’s Challenge program. We help campers build confidence in hearing and producing English in a fun, supportive environment. An efficient language learning pattern (see below) starts with the input of a native speaker. By listening and imitating the model, the learner gains initial proficiency. This is the first goal of classroom language study. To then advance to mastery, the learner needs real-world practice that builds on classroom study. The English Adventure camp environment provides just such an opportunity. For parents, it's an ideal complement to a child's English lessons. English Adventure uses physical, fun-packed outdoor activities and games (no textbooks!) to teach and reinforce new words and interactions. Our consistent approach to real-life camp English gives learners the practice they need to build confidence. Everyday camp life uses certain words over and over, and this constant repetition allows learners to quickly gain confidence. For example, the world "suito" means "water bottle" in Japanese. At camp, we never use "suito", instead we always say "water bottle." After 5 days at camp, even complete beginners can recognize and produce this word with ease. Camp activities and traditions also offer great opportunities to learn. Each main activity has one or more target phrases. For example, in the Team Fire activity, campers will use the polite phrase "May I have a marshmallow, please?" The language is practical and immediately applied. Campers see that their words work! English Adventure staff consistently model usage and support campers as they work to mastery. Started in 2014, this camp tradition combines the many fun activities of camp into a stamp rally souvenir book. Each camper gets their very own passport. 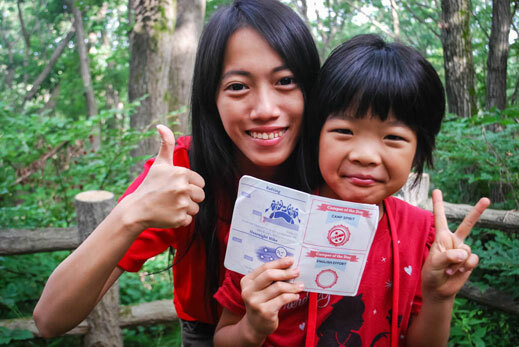 Campers enjoy friendly competition to get stamps for their English achievements. For example, learning the English Adventure "Happy Campers" song as a team gets everyone in your group a stamp. And, when camp is over, the passports provide a durable memory of camp and the great fun campers had speaking English every day. 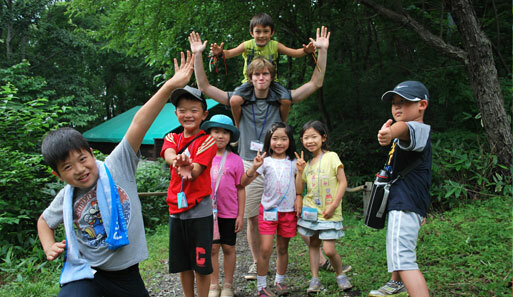 Complete beginners may need some Japanese support to keep activities safe and fun, but we challenge every learner to use as much English as possible, every day at camp. The results: improved listening and speaking as well as greater motivation to learn English when campers return home. The learning doesn't stop with language. English Adventure’s unique international culture nurtures a deeper awareness of the greater world outside of Japan. Campers interact with camp staff from different countries and cultures and learn how to respect and value their differences. At camp, kids learn for themselves, try new things, and become more independent. 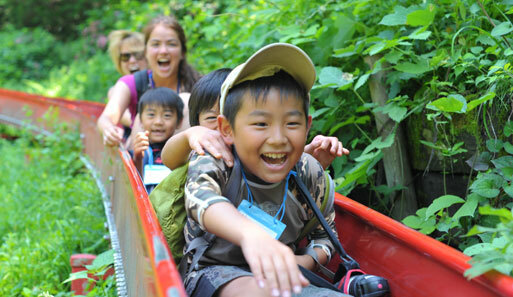 English Adventure's age-specific program design ensures that each camper gets the right level of excitement and fun. Camp staff are there to support campers as they take on new challenges and grow into leadership roles. These rich experiences are key reasons that families choose to send their campers to English Adventure year after year.